And what are you eating this week? It's so annoying to find your last orange like this when you have been looking forward to it, (I love oranges) I sometimes fin onions like this too. I know :( Oranges are my favorite! Your meal plan looks lovely Lena - I didn't post mine this week, but we're having much the same as last week. Your menus always sound delicious! I always considered having the washer and dryer in the basement forced exercise and not an inconvenience. However, my knee has been bothering me so I'm rethinking the whole idea. I try to convince myself that it's a good thing but after a long day chasing the kids it can become a daunting chore... I'm sorry, your knee is hurting!! You must make your chicken salad like we do in Pittsburgh, with French fries on top too. For a long time I didn't realize everybody did not do that,! I lived a little south of Pittsburgh for a while and I never heard of French fries on top of chicken salad. Sounds good. 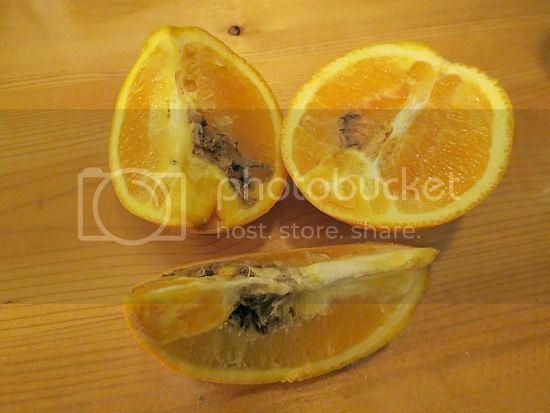 Oranges and lemon that are spoiled are great for the garbage disposal. They will take the nasty funk smell out, unless they are really rotten. I have a look in the freezer plan. I think taco salad?